Jaki Irvine, purchase without E, 2015, HD video, color, sound, 17 minutes 37 seconds. 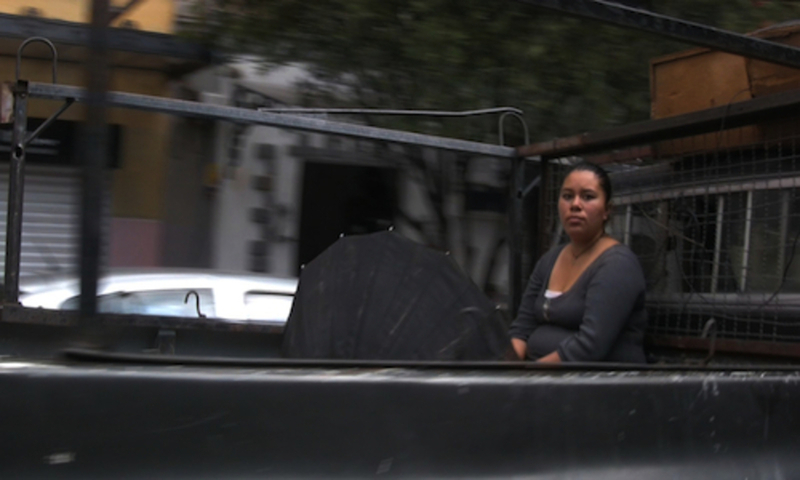 “A Room of One’s Own” offers three site-specific video works, by artists Melanie Smith, Katri Walker, and Jaki Irvine in order to explore postcolonial Mexico through the moving image while exposing the antiquated gender divides inherent to the quotidian experience of Mexico City. Two works in particular, purchase without E (all works cited, 2015) by Jaki Irvine and Trip the Light by Katri Walker, reflect, respectively, on the nuances of sound throughout the city and on the gender binary. Trip the Light is a two-channel video piece highlighting two protagonists of a bullfight—the bullfighter himself and the female seamstress of his uniform. One channel zooms in on the bare feet of the matador rehearsing the intricacies of his dance to an empty arena. Simultaneously, the other video focuses on the movement of a seamstress’s hands during the painstakingly intricate process of beading and embroidering his elaborate costume. Each depends on the other. Elsewhere, Irvine’s purchase without E documents an urban landscape accompanied by the sounds of a recorded female voice blaring atop the noise of a truck lurching down the streets or broadcasts of advertising for used mattresses and home appliances for resale. This compilation methodically entwines the chaotic phonic nuances, through which the city somehow still functions, into the foundation of a sound track to the video. “A Room of One’s Own” does not critique the city but rather illuminates the profundity of its systems beyond the surface, exposing the multiple layers that exist beyond what we actually see.